*GF = gluten free. 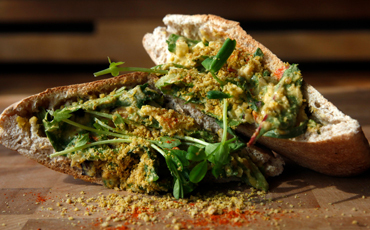 Please be advised that many of our menu items contain nuts & nutritional yeast. Slow cooked house chili with onions, bell pepper, Thai chilis, chili morita peppers, garlic, and our custom spices complete this dish. Comes with a slice of toasted ciabatta (contains gluten), and goji dressing spread. 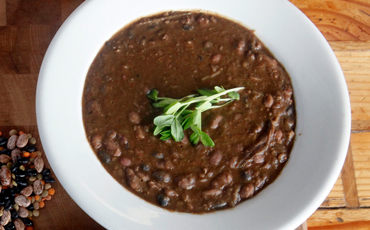 Our signature soup. 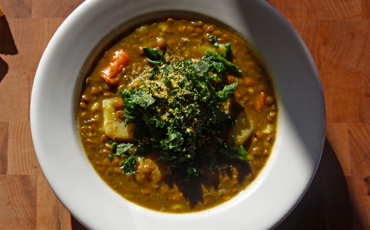 Cauliflower, green lentils, potato, sweet potato, and spice medley. Topped with marinated kale and vegan walnut parmesan. A fragrant and flavorful stir fry. Basmati rice cooked with mixed veggies in coconut oil and tamari Sauce. 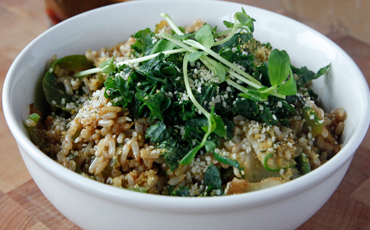 Topped with marinated kale, sprouts, hemp seed, and vegan walnut parmesan. Toasted whole wheat pita (contains gluten) stuffed with hummus, mixed greens, mixed veggies, tossed in cilantro/cashew pesto, cashew crème, and goji dressing. topped with sprouts and vegan walnut parmesan. 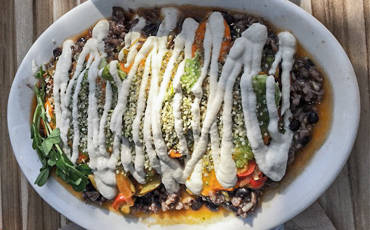 Black beans and rice with grilled veggies, sesame tomato sauce, sliced avocado, cashew crème, and tomatillo sauce. Topped with hemp seed and sprouts. 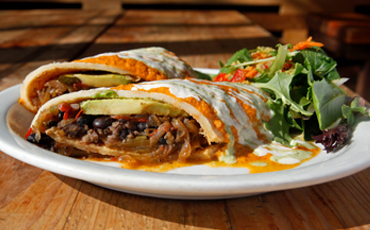 House-made corn tortilla stuffed with black beans, rice, grilled veggies, sliced avocado. Topped with our sesame tomato sauce, cashew crème, and tomatillo sauce. Served with a mixed green salad topped with fresh vegetables, house goji dressing, sprouts, and vegan walnut parmesan.